Story: My two wonderful nieces are visiting us from Mumbai and so we are in a summer vacation mood at home.. so much so that I din't even write my weekly blog post.. I think if you want to learn how to cook - being open to new ideas of mixing ingredients and asking "what's in it" almost every time you like something goes a looong way! That's exactly how I got this recipe for moong vada.. I had eaten moong vadas that need lots of spices and an elaborate preparation.. but these vada's I had at Amit's place were amazingly simple to make... so the "what's in it" conversation followed and here it is..
Take hot water in a bowl and soak whole moong in it 3 hours. Keep the bowl covered. Remove water from the soaked moong and grind it with chilies, hing and cumin seeds into a rough paste. Add minimal water to this mixture and make sure it does not form a smooth paste. Heat oil in a pan and deep fry several vadas at a time. One vada is of the size of a pakoda - little over a tea spoon of batter. That's it! 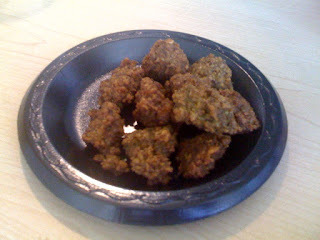 - Enjoy as-is or with tamarind-date or green chutney. Is there a way to make this without deep frying? Maybe bake it or something? @Hasmita - sorry - I am way late on my reply.. I am not so sure about baking.. they might become too hard. May be if you mix in something like a potato or breadcrumbs.. that might work in an oven. If you try the baked version - do let me know and thanks for visiting!